2012 Panini Cooperstown hit the hobby shops this week, and like the overwhelming majority of such “unlicensed” issues, I’ve taken a look and will not be acquiring any of it. I put the word “unlicensed” in quotes because Panini possesses licenses from the MLBPA and the Hall of Fame — the only license they’re missing is the MLB license. Therefore, they just can’t depict logos or team names. For this particular Phillies collector, those lacking elements mean that these cards occupy a gray area: by and large, I don’t feel they are important to maintaining a comprehensive team collection. However, I feel that I must at least give a good look at these releases because occasionally they will include Phillies Philadelphia cards that I think would be cool, and sometimes even essential, to my collection. I don’t want to get into the history of such “gray-area” issues (as opposed to illegitimate or collector issues, such as the Broder cards from the ’80s), but suffice it to say that I frequently embraced them in the past. It was especially easy to do so in regards to plenty of the MSA issues from the ’80s. Aside from quality, the only difference between them and the MLB-approved cards was the lack of logos — somehow, they got away with using team names, but clearly that can no longer occur. Because they featured photography that was similar to the sets issued by the major manufacturers, they didn’t look all that out of place when placed alongside them in binders. But all that changed with the sets Donruss started issuing in 2008. The gray-area sets they issued that year featured minor league players alongside retired players. However, there were no current players to be found. Worse still, they did a poor job of handling the logos and found themselves sued by MLB. 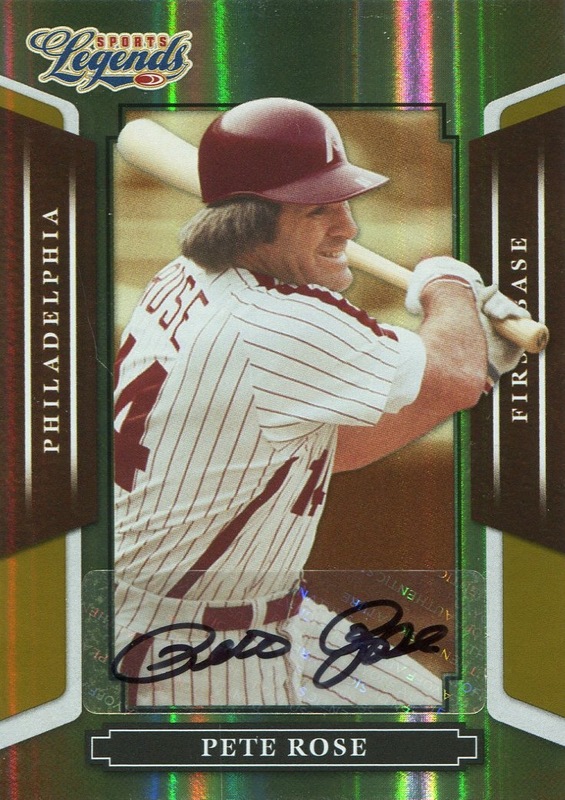 To be fair, they clearly did not airbrush properly, if at all; for example, the ’80s-era Phillies “P” is almost completely visible on Pete Rose’s helmet in the Sports Legends set. I don’t understand why they couldn’t be bothered to make such a minor airbrush, and it’s easy to see why MLB pounced. Even more amazing, Upper Deck inexplicably ignored the incident when throwing together its 2010 baseball set, issued under license from the MLBPA and found itself sued by MLB for the very same reasons. Until recently, however, the 2010 Upper Deck set was something of an anomaly amongst the recent gray-area offerings. For the most part, they continued to feature either retired players or minor leaguers, so it was easy to disregard them, even though “Philadelphia” appeared as a team designation. Yet, that did not mean I didn’t eventually acquire some of the individual cards. 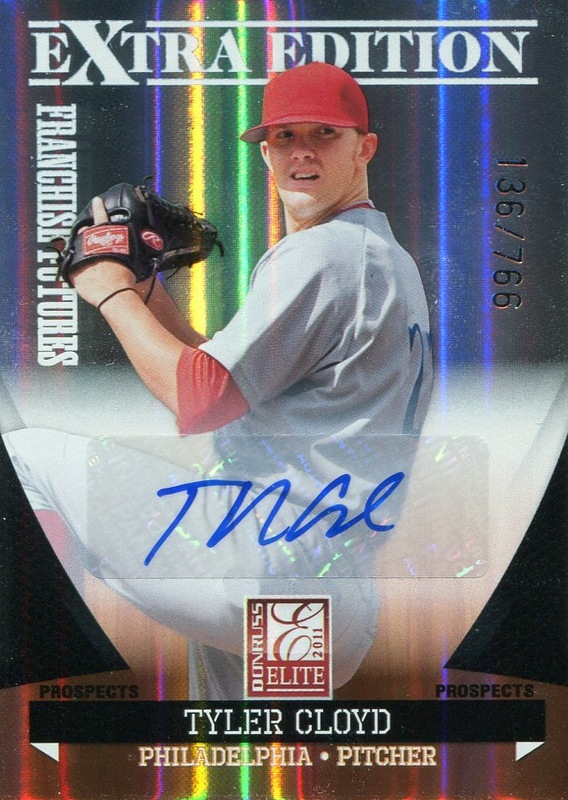 Most notably, Tyler Cloyd, still pitching in Reading at the time, appeared in 2011 Donruss Elite Extra Edition, and Donruss issued autographed versions of the card. Once Cloyd made his major league debut, I treated the card the same way I treat the Bowman Prospect insert cards and quickly purchased one of the autographed cards. 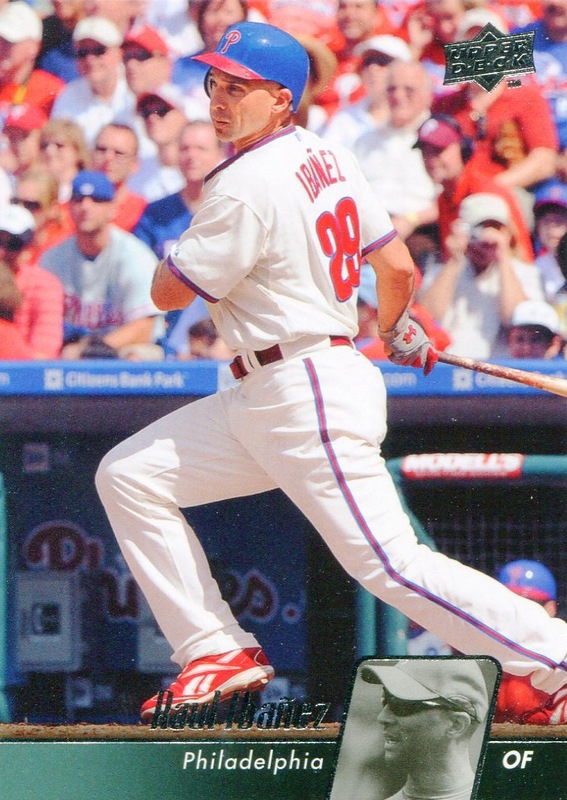 However, I never once considered doing something similar for Vance Worley’s 2008 Donruss Elite Extra Edition autograph because he was pictured in his collegiate uniform — the card looked nothing like a Phillies card despite the fact it stated “Philadelphia.” At least with Cloyd’s card, he was wearing a red air-brushed cap which allowed me to at least pretend he might be wearing Phillies’ colors. Although the Panini Cooperstown set, being in black in white, doesn’t raise any of these issues, a few of Panini’s other, more recent offerings do. Search on eBay and you will find plenty of new Panini cards featuring Ryan Howard, Roy Halladay and Cliff Lee (among others) wearing Phillies red, sans logos and team name. I haven’t purchased any yet, but more than a few of them would look nice in my collection. However, my collection doesn’t seem incomplete without them, and so long as I feel that way, I will likely only acquire items such as the 2011 Donruss Elite Extra Edition Cloyd on a case-by-case basis. 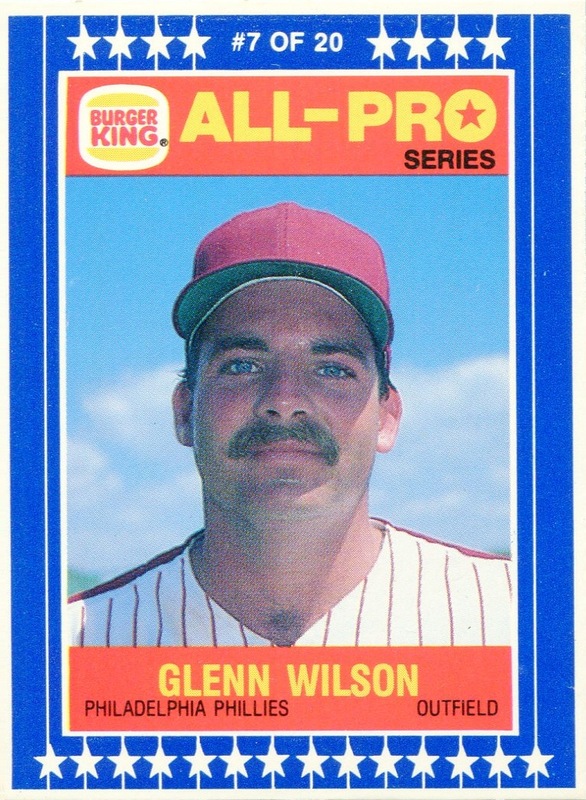 Bask in the glory of this particular Glenn Wilson card. 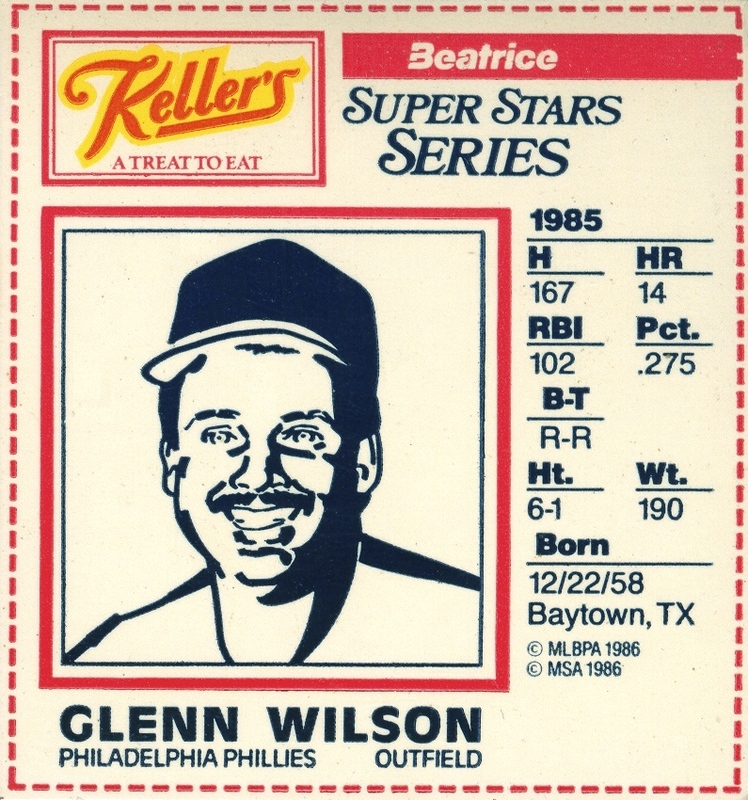 The 1986 Keller’s Butter Phillies set just might be the ugliest Phillies-only set ever produced. At the time this set was produced, you had to go all the way back to the strip cards of the 1920’s to find anything that was of comparable “quality.” If it hadn’t been for a couple Fleer issues from the mid ’90s, I would feel comfortable in calling this the ugliest set in the modern era. If you think there was an uglier one, or you think you can guess which Fleer sets I’m referring to, please feel free to comment about it in this post. Current database progress: 6,846 lines; last set information entered: 2009 Topps Unique.